Question: I am doing some research on how to go about finding and purchasing an unfinished home. I am a potential first time home buyer and would like to save some money. The purpose of my question is to; ask how a person goes about finding an unfinished home to purchase. I am concerned that a general contractor might be immediately put off with me if I were to show up at his job site and ask him about building me an unfinished home. However is this how to go about doing it? Also, would real estate agents have this information? It is difficult to find any information about purchasing and unfinished home. Any suggestions you could offer me would be greatly appreciated. Answer: Buying an unfinished home is a great solution for first time homebuyers, particularly for homebuyers without children. Purchasing and unfinished home is a way to limit the outlay of cash and debt, and enables the homebuyer to grow into the home as the family grows. There are several ways to find an unfinished home to purchase. First, talk to builders who are building either a development or custom homes. I bought two homes this way. In one case I met with a custom home builder and negotiated a contract for him to build me a custom home with the upstairs left unfinished. In another case, we actually found a spec home listed on the market with its upstairs unfinished. Typically unfinished homes are considered “starter homes” so look for the building contractors who are building “affordable housing” vs McMansions. Also keep in mind that in order to build an unfinished home you, or your builder, will have to meet minimum municipal and state code requirements. So, for example in the case of an unfinished upstairs new home construction project, the downstairs will need a bedroom with a door and a closet even though this room may eventually be used as a dining room or den, which may not normally have a closet in it. Also, you will typically need to have a full bathroom on the first floor, along with the kitchen. During housing booms, most builders want to finish the whole house to maximize their revenues and their return on investment of the land purchase. However during, housing busts, you are more likely to find builders that are willing to work with you. You can also contact real estate agents. They will know the builders in your local area who are flexible with buyers and/or that may be in the process of building a housing development. Finally, do not be shy with talking with building contractors. You are their potential customer, and in a down housing market they should be more than happy to have a potential buyer contacting them. For more help on Custom Home building, see HomeAdditionPlus.com’s Home Addition Bid Sheets. 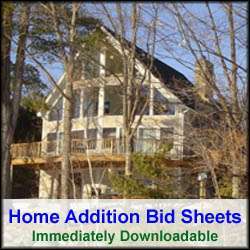 The Home Addition Bid Sheets will help ensure that your home building project goes smoothly and is completed on time and budget. Free Home Addition Price Quotes with No Obligation! Fill out our 3-5 minute quick and easy form, and receive a free price quote on a house addition from one of our prescreened and licensed home addition contractors. This process is free and there is no obligation to continue once you receive your home addition price estimate.